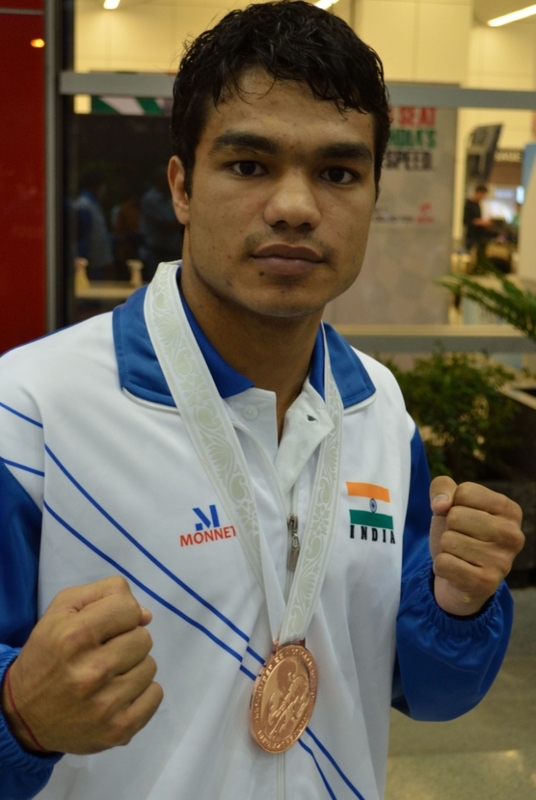 Vikas Krishan (69kg) carried his good form from the AIBA World Championships to Olympic boxing test event at London's Excel Centre, the London Boxing International Invitational. The Indian welter weight boxer continued to ride his purple patch, as he made a place in the finals of the event with a brilliant victory over Azerbaijan boxer Ismet Eynullayev. With this win the 19 year old is assured of at least a silver medal finish from the tournament. The 2010 Asian Games gold medallist, who bagged a bronze medal at the World Championships along with an Olympic quota, was at his destructive best as he devoured his opponent with as much brain, as brawn. Vikas, who got a bye in the QF, started cautiously with the intent of measuring his opponent first. At the end of the first round the score was knotted at 2 all. In the second round the Haryanvi lad opened his game exploiting his opponents? weakness, he dominated play, scoring 3 points as opposed to Ismet?s 1. Vikas managed to hold on to his lead and was aided by a warning which Ismet received in the third round. He went on to secure his place in the finals with a 9:6 triumph on points. In the summit clash Vikas will lock horns with Qiong Maimaitituersun a bronze medal winner at the 2010 Asian Games. Asian Games silver medallist Dinesh Kumar (81kg) had to settle for a bronze medal after losing his semi-final bout against Yamaguchi Florentino of Brazil, a silver medal winner at the 2011 Pan American Games. But the Indian light heavy weight boxer did not go down without a fight. The 23 year old provided a brilliant account of his hard hitting and accurate punches in a bout that saw him make a stunning recovery. Dinesh, who got a bye in the round of eight, was down a four point deficit after the first two rounds, but he came back strongly in the third to even things out. After the nine minutes of swashbuckling action the score were level at 18 all. But unfortunately Dinesh lost to Florentino on count back (50:57) and had to make do with a bronze medal performance.